Living The Dream: Why exactly are there snakes on this plane? Why exactly are there snakes on this plane? The President is refusing to compromise on anything. Washington is careening toward a partial government shutdown on Tuesday amid its usual synthetic outrage. As the partisan cries grow in volume, it's worth a few minutes to sort the truth from the nonsense. The first thing to keep in mind is that this does not mean "anarchy," in Harry Reid's typically subtle formulation, or even a complete government shutdown. Functions deemed "essential" will continue, and it's debatable how many of those really are crucial to daily American life. The military will be paid, Social Security checks will still go out. Many Americans will be inconvenienced, but tens of millions may come to realize how easily they can do without most of the vast federal Leviathan. A second reality is that both parties are responsible for getting to this point. Americans chose a divided government in 2010 and again in 2012, electing House Republicans as a check on Democrats whose undiluted liberalism alarmed millions of voters when they ran the entire government in 2009-2010. The inability to compromise now is rooted in the wide disagreement about the role of government that now separates the two parties. We've criticized GOP Senator Ted Cruz for his strategy to make defunding ObamaCare a requirement of funding the rest of government. He and his allies know that Mr. Obama can never agree to that, and even millions of Americans who oppose ObamaCare don't agree with his shutdown ultimatum. 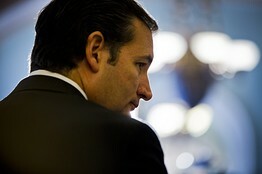 It risks political damage for the House and Senate GOP in 2014 even as Mr. Cruz builds his email list for 2016. Yet it takes two to tangle, and Mr. Obama is as much to blame for the partisan pileup as Mr. Cruz. This is a President who is eager to negotiate with dubiously elected Iranian mullahs but can't abide compromise with duly elected leaders of Congress. He refuses to negotiate at all over an increase in the federal debt limit, claiming this has never happened. Like so much that Mr. Obama says, he knows this is false. His own staff suggested the spending sequester during the 2011 debt debate, and Democratic Congresses have used the debt limit to extract concessions from Republican Presidents. Mr. Obama also refuses to bend on any part of ObamaCare—except when he unilaterally announces bending in his own political interest. He decided on his own, and contrary to the plain text of the law, to delay for a year the business mandate to provide insurance for employees. He also unilaterally delayed verifying the income of Americans seeking subsidies. He did this to pile more people into the ObamaCare exchanges, lest they fail, and to limit the harm to job creation before 2014. Yet now he'd rather see the government shut down than accept the ObamaCare compromises that House Republicans have put in their latest government funding bill. He refuses to delay the law for a year though his own actions reveal it is not ready for prime time. And he won't even accept repeal of the medical-device tax that 79 Senators, including 33 Democrats, are on record as supporting. The tax is already hurting innovation and sending jobs overseas. Mr. Obama's refusal to negotiate suggests that he wants a shutdown—either over the budget or debt limit. His agenda is dying on Capitol Hill, because of Senate Democrats as well as House Republicans. With his approval rating down and independents leaning toward the GOP, he figures his only chance to salvage a second-term domestic legacy is to restore Nancy Pelosi as Speaker in his final two years. His best opening to make that happen is a shutdown or debt-limit crisis that he will try to blame on Republicans. A shutdown is as much his strategy as it is Mr. Cruz's.